Encourage your students to experiment with multimedia submissions, like video blogs or podcasts. Your students can easily create and submit short (up to three minutes) audio/video projects. Because this feature can be disabled by your system admin in the Domain Options tab of Domain Settings, you may need to verify that your domain is configured for these submissions. Under Gradebook Settings in the Assignment Editor, select either Single document or Multiple documents. Instruct students on how to create audio/video submissions. 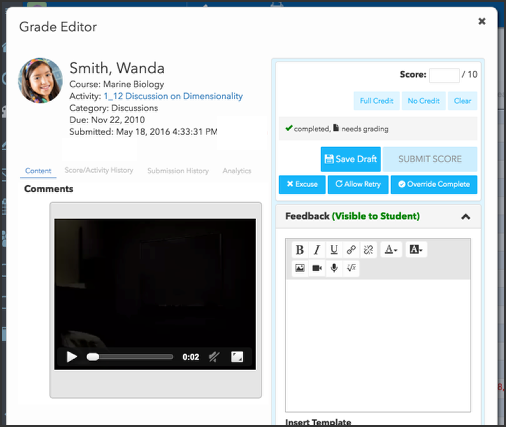 When you review audio/video submissions with the Grade Editor or Activity Grader, the audio/video files appear in the Content tab.